Info "Don't be a basket case! Catch the balls!" Nice Catch is one of WarioWatch's microgames in WarioWare: Twisted! The game's purpose is to catch or spear balls. To do so, the player has to move the person left and right to catch a specific number of balls. The number is indicated in the starting message of this game. If the player manages to do so, they win. The player starts off the game with 20 seconds. 1st level difficulty: Catch three balls inside a big basket. 2nd level difficulty: Catch two balls inside a smaller basket. 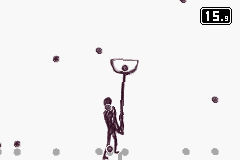 3rd level difficulty: Spear one ball with a stick.